Wednesday morning was bright and sunny although a cool wind pervaded which gave encouragement to 9 Members and Guests gathering at the Golf House Hotel, North Ballarat for Lunch and the usual catch-up and up date on activities from around the State as well as the details of developments from the Association as a whole. Our best wishes to all who were unwell and look forward to seeing them returning to our ranks soon. 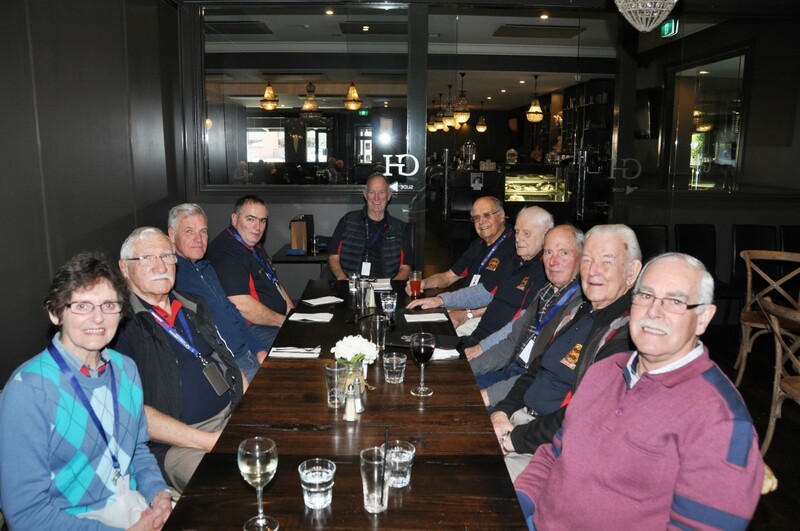 On a cold, wet and windy day, 4 members of our Ballarat & Central West District met at the Robin Hood Hotel Bistro for lunch and a catch up. Due to the weather and several members being unwell or away we recorded a larger number of apologies than normal. However we enjoyed the friendly atmosphere of our hosts and the chance to discuss the development of our District. We will continue to encourage as many former colleagues as we can to join and strengthen our base in this District. All agreed to reconvene on Wednesday 10th December again at the Robin Hood Hotel Bistro for a pre Festive Season meeting to commence at 12 noon. 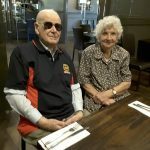 The meeting of our South West District was conducted with a change of venue, being the Macarthur Hotel for lunch and this was followed by a visit to the Macarthur Wind Farm. The staff of the hotel provided us with a very friendly welcome and an interesting menu. The formal section of the meeting was briefed on the activities of the Association and the various Districts. Again weather and illness played a part in there being only 9 members, with 8 apologies able to attend on the day. Bob Reilly, who organised the event, unfortunately could not attend. We thank him for his efforts. Following lunch and the more formal structure, we headed for the Macarthur Wind Farm and were met by Operations Manage, Brendan Ryan, Brendan gave us a very interesting presentation on the operations of the wind farm and provided a guided tour of the Operations Centre, followed by a close up view of one of the 140 working towers. We look forward to the final meeting for the year at the Lyndock Aged Care Facility on Monday 15th December. 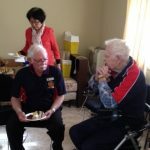 RAAV members living in the Geelong & Surf Coast had another enjoyable meeting at the RSL on 20th August. There were 12 members present and it was great to once again see Ian Cameron who chaired our informal meeting. 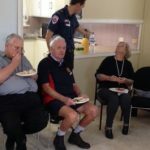 He informed us that our membership in Geelong currently stands at 25 and that this increase in membership has been largely achieved through the efforts of a small local working group who continue to approach retired ambulance personnel. Ian also enlightened the meeting of the formation of other groups around the State and that positive interest has been expressed by these various groups to hold joint social and interest meetings. To this end, the Geelong Group has agreed to strengthen its ties with like minded groups across the State and an informal contact has already been made with fellow RAAV members in Warrnambool, with the view of holding a joint meeting early in the New Year. In the interim the next meeting of the Geelong RAAV Group will be held on 19th November, 2014 at the RSL in Geelong to commence at 12 midday. Any RAAV member available is welcome to attend. On Saturday 26th July our North East District members gathered at Benalla Bowls Club for their usual lunch and get-together. With 20 members and guests in attendance and several apologies, mostly due to the cold weather, we were pleased to have our President, Chas Martin, who gave us an update on the Association and thanked all for their support. Our next meeting will be on Saturday 29th November also at Benalla Bowls. The first meeting of our North West District was convened at the Mildura RSL on Friday 11th July where 3 members and 1 quest were in attendance. Following an enjoyable lunch we discussed the possibility of forming a regular meeting base in the area. All agreed to attempt to locate former colleagues and encourage them to become involved. Due to time and distance we will be reconvening in the new year. 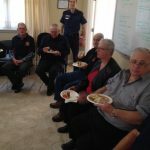 South & West Gippsland District With 5 members and guests attending and 4 apologies we enjoyed a friendly and inviting lunch at the Morwell Club despite the inclement weather. It is pleasing to note that Neil Hall has accepted the position of Co-ordinator for our District and will become more active an contacting former colleagues over the next few months. Our Secretary, Ian, provided an update of the Associations activities and gave us a demonstration of the new web site. We look forward to our next gathering on Wednesday 24th September. Our small but active group met at the Robin Hood Bistro for lunch and with an attendance of 4 members and 3 apologies. We discussed the need for encouraging more members to join and enlarge this Membership base. Our Secretary, Ian Cameron, brought us up to date on the other districts and passed on the suggestion from Geelong & Surf Coast for a combined meeting in the future. We all agreed this would be a great idea and will co-ordinate a suitable date at a late time and place. A further suggestion was the possibility we meet with our South West District members as well. Due to the small numbers present we decide to hold over the position of Co-ordinator until the next meeting. Our next meeting will again be at the Robin Hood Bistro on Wednesday 17th September at 12 noon. 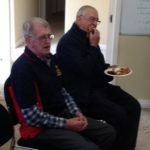 The SW Meeting of the Retired Ambulance Association took place at a new venue, the Cally Hotel Fairy Street Warrnambool, with an attendance of nine members and apologies from a further seven. A welcome guest from Melbourne was Ian Donaldson. Secretary Ian Cameron bought all members up to date with news from the Association and guest speaker, Paul Lougheed, spoke of his work with people who have various degrees of disabilities. The subject matter related to a disabled football team in the SW and a program to teach people with disabilities how to surf and use recreational craft on water. I believe all present got a good insight into the area of people with disabilities. A good meal was held by all with excellent camaraderie and a finishing time after 1400hrs- who cares it was a good day. The next meeting will be held at the Macarthur Hotel on Monday 1st September at 1200hrs, with a guest speaker talking about the Wind Farms in the area. The meeting will be followed by a visit to the Macarthur Wind Farm. Thanks to Bob Reilly for organising the speaker. All members are urged to attend and visitors will be welcome. Please contact me if you would like to attend.